Microsoft launches Outlook Groups app for Android, iPhone and Windows Phone. 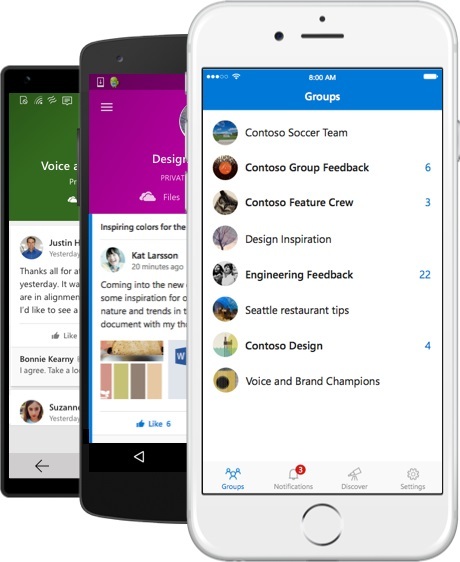 Microsoft today launches a new mobile app called Outlook Groups. With the new Outlook Groups mobile app for Windows Phone, iPhone and Android, you can now engage with your group on your phone while on the go-continue conversations, view files, @mention colleagues and even discover other relevant groups. Outlook Groups enables you to engage with your team on the go with an Office 365 work or school account. Take part in the latest discussions, share photos and notes and collaborate on files. Outlook Groups app leverages the Office 365 Groups service to enable group communication - You can stay on top of your group email, group files, and calendar appointments for groups you are part of. You can quickly start a new post directed to the group, reply to the group, @ mention a person or group, and "like" messages. You can view group files and work together with your group on Office documents (Word, Excel, PowerPoint, OneNote). You can receive notifications when someone responds and likes your messages. You can also discover and join new groups from the app. All these capabilities for an Office 365 Group are not available when you interact with group messages in Microsoft Outlook app. How is Outlook Groups different from Outlook Mail on my phone? Outlook Groups is a tailored app for all-up group communication while Microsoft Outlook allows you to catch up and respond to group messages in your Inbox for the groups you are subscribed to.